Search for the best flight prices from Manchester to Pula. Compare prices, book today and save money with Manchester Airport. With sun-kissed beaches, stone-built towns and picturesque fishing villages, it’s as unspoilt, diverse and inviting as you could wish for. With powerful Italian influences (you’ll still hear it widely spoken) it often feels like this former Yugoslav republic should be on the other side of the sea. 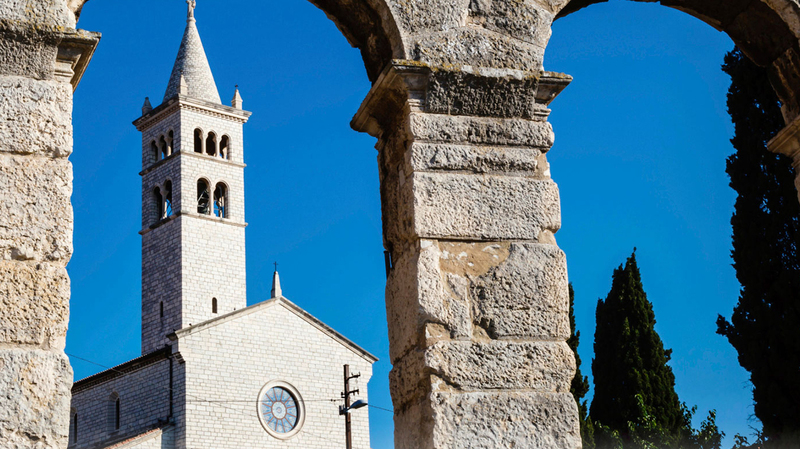 Istria is famous for many things, particularly its herbal oils and truffles, so picking up gifts or souvenirs in Pula is generally straightforward. The City Farmers’ Market (Narodni trg 9), housed in an attractive structure, has been part of Pula life for well over a century and remains a treasure trove of fresh produce and craft stalls. Elsewhere, the streets of Sergijevaca and Kandlerova are busy shopping thoroughfares – good for clothes, jewellery and design boutiques – while specialist stores include Aromatica (Laginjina 4), specialising in soaps and essential oils, and Zigante Tartufi (Smareglina 7), selling truffle-based goods. It’s easy to eat well in Istria. The plaudits hang heavy at Konoba Batelina (Čimulje 25), sitting a little way out of town but recently named the best restaurant in Istria. It’s famed for its well-crafted seafood dishes. On a more basic level, Jupiter Pizzeria (Castropola 38) attracts plenty of positive reviews and serves good pasta and pizza, while the bistro feel of Farabuto (Sisplac 15) is an excellent bet for both Italian and Croatian dishes. Elsewhere, the traditional home cooking at the simply decorated Vodnjanka (Vitezica 4) is well worth seeking out. Three days of historical re-enactments and heritage-themed celebrations are held across three of Pula’s ancient sites. Mingle with legionaries and gladiators, attend workshops, watch costumed performances and soak up the city’s Roman past. A platform for national theatre groups to showcase their work in front of local audiences. Productions (which are almost exclusively performed in Croatian) take place in the city’s streets and squares, producing a lively communal feel. A well-established ‘dance and lifestyle’ festival, Seasplash combines a rainbow mix of different genres – among them reggae, electro, jungle and ska – with other attractions such as boat parties and alternative workshops. This renowned cinematic gathering attracts significant interest from overseas, having been in existence for over six decades. It runs for 15 days – memorably, some films are shown on an open-air screen in the amphitheatre. Billed as the ‘largest bass music and sound system culture festival in Europe’, Outlook draws big names from the dance music world to a stunning setting on the edge of town. It’s now become popular with festival-goers from around the continent.